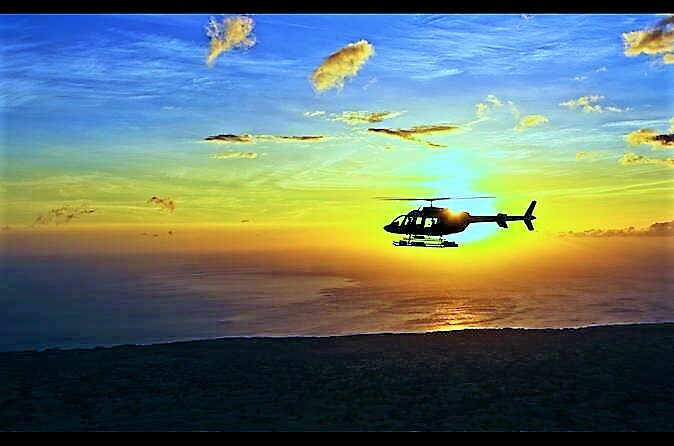 A Hawaii helicopter tour of the Big Island is a thrilling experience, offering the best seat in the house for many Big Island sights that can only be seen from the air. Experience everything from the fury of Kilauea, the most active volcano on Earth, to the Big Island's spectacular north coast. Watch in awe as the stunning scenery of Hawaii's largest island unfolds beneath you. Tours originating in Hilo are closer to Kilauea Volcano and the active lava flow, as well as the scenic waterfalls and tropical rainforest on the east side of the island. Tours out of Kona are longer and more expensive, and you will see more of the Big Island when you fly from Kona. Now is the best time to book a Hawaii helicopter tour, since Kilauea Volcano is putting on quite a show! We never know how long it will last. Click on the links for a more detailed description of each tour. 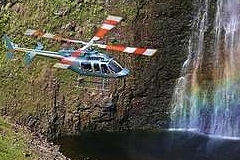 The 2-hour Circle Island helicopter tour shows off all the best of the Big Island. Soar along the coastline to the south side of the island to witness the spectacle of lava flowing as you fly directly above the active Kiluaea Volcano. 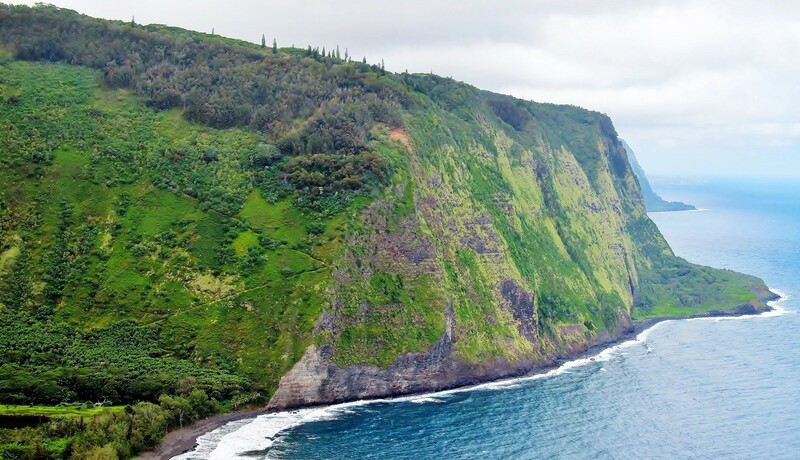 Then fly up the Hamakua coast and over rainforest waterfalls, zip between massive Mauna Loa and Mauna Kea volcanoes, above the beautiful Waipio Valley and the magnificent north coast of the Big Island. This tour departs from the Kona airport and lasts approximately 2-hours. See the best of Kilauea from the air and on foot. This Big Island helicopter tour starts in Kona and flies along the coast to the active Kilauea Volcano, where you will see the stunning display as lava flows down the mountain toward the ocean. After landing in Hilo, your motorcoach will transport you to Hawaii Volcanoes National Park for more exploring. Along the way, your expert interpretive guide will point out many fascinating features in the park, including Kilauea's Halema'uma'u Crater where lava bubbles to the surface, and a tour of Thurston Lava Tube. This adventure isn't over yet! Near the end of the day, it's back to Hilo for another helicopter tour, passing over even more stunning scenery on the return flight to Kona. Tour is approximately 10-hours, departing from and returning to Kona. This two-hour Circle Island tour begins with a traditional Hawaiian lei greeting and champagne toast. Then take to the air to see all the best of the Big Island, the volcanoes, the rainforest waterfalls, the stunning coastline. Fly over Kohala, Mauna Loa and Kilauea, where the lava flow will be glowing as the sun begins to disappear behind the mountains. Your tour winds down as you fly north along the west coast, just in time for a magnificent Big Island sunset. Approximately 2-hours with champagne and flower lei. A six-passenger Bell 407 luxury helicopter whisks you away from Kona to enjoy a magnificent tour of the most active volcano on earth. After watching Kilauea's dramatic display, you will fly north over tropical rainforest and cascading waterfalls, to a private landing in Kohala for exploring a secluded location. Approximately 3-hour flight. A more extended version of the above tour, this Hawaii helicopter tour includes more exploring in Kohala plus a tour of the artist community of Hawi before flying back to Kona. Picnic lunch is included. Approximately 8-hours; departs from and returns to Kona. On this 45-minute Big Island helicopter tour from Hilo, you will be amazed by the spectacle of the Kilauea Volcano as you see areas of volcanic activity and lava flow that are only visible from the air. You will also fly over the tropical rainforest and see breathtaking waterfalls of the Wailuku River as it flows down the east side of Mauna Kea. Four-passenger Hughes 500 helicopter with guaranteed window seats. Approximately 45-minute flight out of Hilo. Experience the excitement of the Volcanoes & Waterfalls helicopter tour described above, with the added thrill of flying with doors off! Get a better view of Kilauea's splendor with nothing but open space between you and the flowing lava. Approximately 45-minute flight out of Hilo.